Remote temperature monitors are a long time product offered by Comfort House. They are used by our customers to alert when the temperature at their home, remote cabin, or business drops to a set temperature, such as 45°F. The temperature monitoring system, usually a small box-like device, dials out to the phone numbers you have programmed, and notifies you so that you can take action to prevent your pipes from freezing. Monitoring temperature in computer rooms and data centers is another big application. When the temperature rises, personnel is alerted so that the cooling system can be checked for proper operation. There are all sorts of other uses, too, such as making sure the temperature at home isn’t too cool or warm for pets, plants, wine cellars, swimming pools, greenhouses, horse stables, and home brewing. Temperature monitors have traditionally operated by hooking up to your telephone line and dialing out to you in the event of a triggered condition. Now we’re excited to offer our first web based system. The La Crosse Alerts Temperature and Humidity Alert System is a web based temperature monitoring system that sends emails or text alerts when temperature or humidity exceeds your desired range. 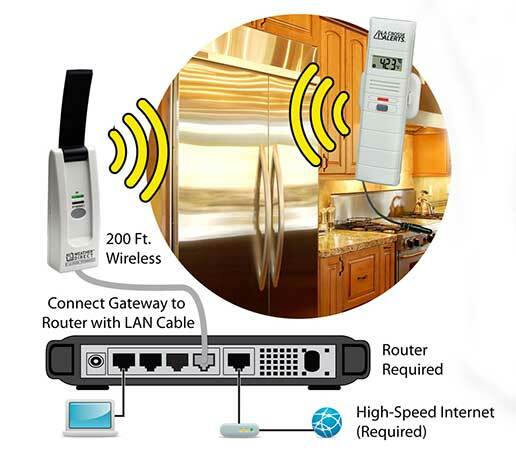 The small gateway unit plugs into your router and has a wireless remote sensor with 200’ range in open space. The included remote sensor measures ambient air temperature and humidity and has your choice of a 6’ detachable dry probe or wet probe depending on your application. You can purchase up to 5 extra sensors for use with each system. Your data is uploaded to a monitoring site, called La Crosse Alerts, that you can log into from anywhere via iphone or other smartphone, tablet, or computer to view current readings, see a 7-day graph, download history, and control your alert settings. The system with gateway, sensor, probe, and one year of full monitoring service, is in my opinion very reasonably priced at $85. Sensors beyond the included one are $66 with dry probe and $73 with wet probe. After the first year there is a monitoring fee for the full or “enhanced” La Crosse Alerts service. Basic service which you receive for 5 years entitles you to log-in to view your data from a single sensor only and does not include email or text alerts. We'll update our blog or website once we receive the cost for enhanced monitoring after year one. There are some disadvantages to the La Crosse unit vs. one of our traditional telephone based units such as the Control Products Deluxe Freeze Alarm. For instance, with Deluxe Freeze Alarm you can add optional sensors for security or water level, and remotely switch a relay to turn on your heat or AC. There are also never any monitoring fees. Equipment available at the location being monitored is important to the type of system you choose. Your secluded vacation home may only have a landline phone and not a high speed internet connection required for a web based system. And in the event of power outage, unless you are fully equipped with a backup power source, you will have more luck receiving your alerts with a traditional phone based system on an old fashioned copper line. However, the web-based system will notify you of connection loss, which could indicate a possible power problem. Enjoy your remote temperature monitoring!